Box Dimensions (LxWxH)	6.8 x 5.4 x 5.4"
The EF 14mm f/2.8L II USM Lens from Canon offers a bright maximum aperture and provides an ultra wide-angle view with the shortest focal length in the line-up of L-series lenses. Its diagonal angle of view is an impressive 114° - anything larger would be a fisheye lens. This lens features completely redesigned optics, including two high-precision Aspherical elements and two UD-glass elements. This results in better contrast and sharpness at the outer edges, and a reduction in chromatic aberrations that can sometimes be seen with high-resolution digital SLRs. 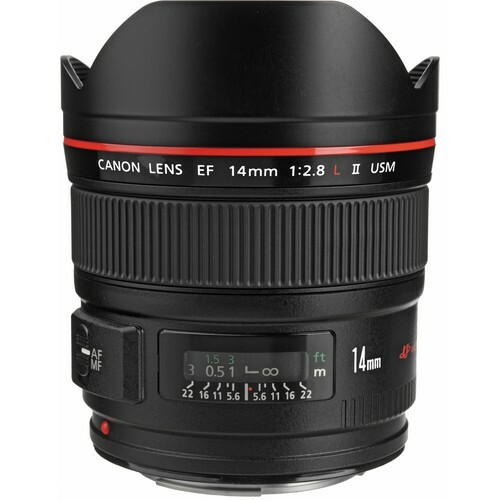 Its minimum focus distance is 7.9" and its truly circular diaphragm helps to create a pleasing out-of-focus background. 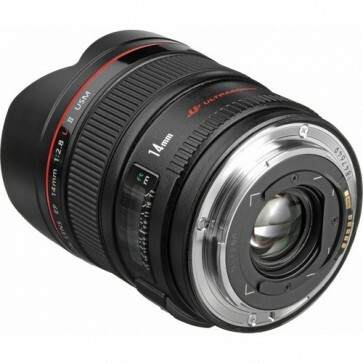 The 14mm f/2.8L II USM lens uses a rear focusing system, high-speed CPU, and a ring-type ultrasonic autofocus motor (USM) with revised electronics for faster, more responsive and quiet AF. Manual focus override allows for precise manual focus even in AF mode. 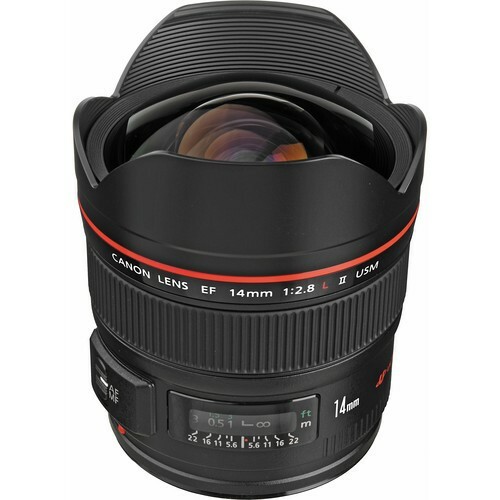 This wide aperture lens is the ideal choice for architectural, wedding, or other pro-level photography applications and its moisture proof and dustproof sealing helps to ensure its durability. A ring-type ultrasonic motor (USM) uses ultrasonic frequency vibrations to drive responsive, near-silent high speed auto focus. Good holding torque stops the focusing lens group with precision without overshoot. Full time manual focus override is available without having to switch out of AF. Two UD (ultra-low dispersion) glass lens elements correct chromatic aberration to achieve high resolution and contrast, without color fringing on subject outlines. Two AL aspherical lens elements suppress aberrations for high image quality at all focal lengths. Equipped with a fixed, petal-type hood and a gelatin filter holder at the rear. Only lead free glass is used in the lens construction.